The Kick Galvanic: Deleting your friends for a Whopper? Have it your way. Deleting your friends for a Whopper? Have it your way. You may have heard about this old campaign already, but I find it such a cruel, insanely funny ad that I just have to blog about it. Burger King's Whopper Sacrifice campaign demands no less than the pain and aggravation of choosing 10 friends to be deleted from your own Facebook account so that you can receive a free Whopper that's worth $3.69, or approximately Php 180. What's even more demented is the fact that these rejected friends will each receive an alert on their respective Facebook accounts that they have been deleted. 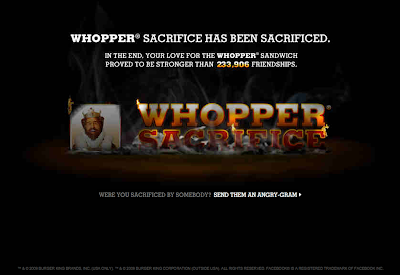 Naturally, Facebook wasn't happy about the whole thing, so in the end, Burger King had to sacrifice the campaign.